Issues: Kingdom Hearts Chain of Memories and Kingdom Hearts Re:Chain of Memories stats, Journal entry, Determine quantity of cards in Deck Statistics section. Allows use of cards even while staggering from damage. Immune to fire, but stunned by ice. Axel appears as a boss in Kingdom Hearts Chain of Memories, its remake, Kingdom Hearts II, and Kingdom Hearts Union χ. In Kingdom Hearts Chain of Memories and Kingdom Hearts Re:Chain of Memories, Axel battles Sora twice throughout Castle Oblivion. In Kingdom Hearts II, Axel fights Roxas twice in the Simulated Twilight Town. In the first battle Axel is an easy opponent. Just simply use Blizzard cards as they deal massive damage to him. Additionally, if Sora has a Moogle Room card, one should be able to obtain more Blizzard cards. In the second battle, Axel is much more difficult as he has more damaging attacks and is much faster. It is strongly recommended to have the Oogie Boogie, Jafar, Vexen, Card Soldier and Riku cards equipped. The Darkside card can allow Sora to copy Axel's Quick Recovery enemy card, making him immune to Axel's sleights, but if Sora carelessly copies the Red Nocturne card instead, it will boost fire attacks, which heal Axel. Have plenty of Blizzard cards and a Blue Rhapsody card, since Axel is weak to the Blizzard element. The best way to defeat Axel is to first equip the Jafar card preventing him from breaking attack cards. After the Jafar card runs out it would be wise to equip the Vexen card since odds are Sora might fall before he can use either the Card Soldier or Riku card's full potential. Also, bear in mind that his fire attacks will be able to stun Sora once the Vexen card is active, so only use it when Sora is about to be defeated. If and when Axel defeats Sora, the Vexen card will revive him. Immediately activate the Oogie Boogie card to regenerate his low health. After Oogie Boogie runs out, it is wise to unload on sleights. For maximum results use the Riku card so that some of the cards Sora uses will not be lost. The Trinity Limit sleight (use a Goofy, Donald and attack card) could be fairly damaging, but it takes a long time to activate and Axel could easily use a 0 card or a sleight with a higher value to break the sleight before Sora damages him. Instead use it when he reloads his cards so he won't be able to break the sleight. Also use Blizzara/Blizzaga by stocking two or three Blizzard cards, respectively. You can also use Blizzard Raid by stocking one Blizzard card and two attack ones, to use only one Blizzard card for a strong enough attack on Axel, but don't forget to reload them with an Ether or and Elixir. Donald cards are very risky; his Thunder does some damage, his Blizzard does high damage, but Fire will heal Axel, so refrain from using Donald at all, unless for Trinity Limit. If Axel is not defeated by the time the Riku card ends then equip the Card Soldier card and attack him repeatedly. Since the Card Soldier card speeds up attacks significantly if Sora attacks Axel non-stop, this can stop him from using some sleights. When the Card Soldier runs out and if Axel is still alive, odds are his HP will be low enough for him to be finished off with one or two more sleights. While his regular attacks are the same from before, his sleights are much more powerful. When Axel yells, "Let the flames burn you! ", be on guard—this is his most dangerous attack where he lets out a wall of flame. This is for the most part unavoidable, so it is advisable to immediately use a 0 card regardless of whether or not Sora is close to Axel. If Sora can't use a 0 card (in the event that they have been used up already and haven't reloaded), then be sure to cast Cure immediately afterwards. "Defeat the mysterious man Axel! Fight using the mystifying Keyblade!" Axel faces Roxas the first time during his Struggle match. This battle is not too difficult. Axel's main attack is a two-hit combo in which he moves forward slightly, which can easily be avoided. 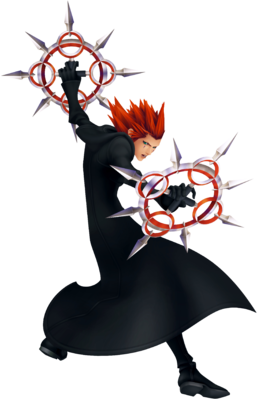 Axel will also suddenly dash behind Roxas, similar to the "Reversal" Reaction Command, and throw his flaming chakram through the air at him, hitting him multiple times. He will also throw a single chakram, which circles towards Roxas from the side. Have at least two Potions, and the Aerial Recovery ability equipped. If Roxas has leveled up enough so he learns Guard, it can also help. It is advised to stick to aerial attacks to avoid Axel's strikes and use Aerial Recovery to quickly regain balance and counterattack when struck. If Axel's attacks are blocked with Guard or Roxas's own attack, he will be temporarily stunned. The most important thing to do to when this fight is to not rush in and attack him from the front or he will do a series of multi-hit chakram throws. Instead make Roxas jump to the side, then launch an attack on him. When Roxas battles Axel again in the Old Mansion, the strength of both Axel and Roxas have increased. Roxas is now dual-wielding the Oathkeeper and Oblivion, so he does more damage. However, Axel has much more health and several new forms of attack. Roxas should be equipped with the Elven Bandana from the mansion to boost his defense and have several Potions stocked. When the battle begins, Axel will yell "Burn, baby!" and the floor of the arena will become covered in magma, this causes Roxas to slowly lose health over time. If Roxas hits Axel with a finishing move, he will be knocked into the air and Roxas can use the "Overtaker" Reaction Command. This will cause Axel and Roxas to run across the flames dueling and eventually Roxas can use the "Clear Light" Reaction Command, which slams Axel into the ground. This removes the magma from the ground and stuns Axel for a short time. After this, Axel will throw his flaming chakrams at Roxas and also strike him with a multi-hit combo, ending with him summoning a jet of fire from the ground. This attack does heavy damage if Roxas is caught in it. Axel will also leap behind the flames surrounding the arena and jump out without warning, leaving plumes of flame behind him. Use the Reaction Command "Burst Edge" to leap out of the way and throw Oblivion at Axel, damaging him. Later in the fight, Axel also covers the floor in magma again. This can be countered as before. Axel can be a difficult opponent, as he attacks rapidly and can catch Roxas off-guard. The Data Rematch Axel that Sora fights is based on the second fight, with Sora fighting him alone in a ring of fire. 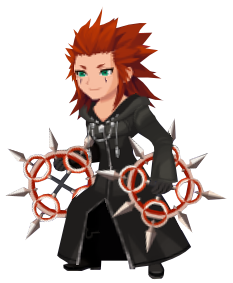 Axel will have higher HP and stronger attacks than his earlier version in Roxas's storyline. Be sure to equip the Mysterious Abyss Keyblade as it has the Blizzard Boost ability which can allow maximum damage to Axel's fire-based attacks. Stock up on Ethers and Potions as they'll be handy in the battle. Reflect is also an alternative to using Blizzard, as it can do similar damage. Be sure to make use of the "Overtaker" and "Clear Light" Reaction Commands as they will cease the damage Sora receives from the magma floor. In this battle, Sora's HP will drain very rapidly unless the player "Clear Light" to stop his "Burn Baby!". A good strategy is to have Auto Limit on to transform and restore Sora's HP if he's in critical condition while his MP is recovering. Equipping Ultima Weapon along with MP Haste and MP Hastera can reduce Sora's MP recharge to a mere 15 seconds. If the player uses two finishing moves on Axel with one combo (using Finishing Plus) he will jump outside to attack Sora. This will allow Sora to counter with Overtaker and then "Clear Light" to prevent anymore damage to his HP. Axel also cannot be beaten while the floor is on fire. Limit Form with MP Rage equipped is also a good idea as performing limits will damage Axel and restore Sora's HP. The HP drained will be converted to MP for Sora to use in an endless cycle as long as he's still in Limit Form. This page was last edited on 3 April 2019, at 16:47.